"The singing, drums and dancing mixed with the smell of sage to create an energy that I never want to forget," wrote Audrey Stillwell, a senior nursing student from Madison, Ind., in a blog post after taking part in a Lakota Sioux pow-wow on the Pine Ridge Reservation in South Dakota. 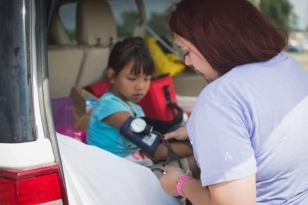 Stillwell was one of seven IU Southeast nursing students who traveled to the reservation this summer as part of a course in pediatric community clinical nursing. The course is a unique example of IU Southeast’s commitment to service learning and community engagement -- an academic immersion that takes students deep into another culture, with benefits for both. The experience is the creation of Dr. Julia Mattingly, assistant professor of nursing and a community/public health nurse with a professional interest in underserved populations. She first journeyed to Pine Ridge in 2011 with acquaintances engaged in humanitarian aid. "I fell in love almost instantly," she said. In 2012, as part of her doctoral capstone at Loyola University in Chicago, Ill., she returned to the reservation and successfully implemented an environmental childhood obesity intervention focusing on best practices in nutrition. She had already begun taking student groups to Pine Ridge as early as 2011, blending health promotion and service learning. The trips continued when she joined the IU Southeast faculty in 2015. There could be no better place than Pine Ridge for the students to learn about delivering community health to underserved populations. Two plane flights and a seemingly endless car ride away from New Albany, the reservation is home to the Lakota Sioux tribe, 19,000 people in the middle of the vast rolling prairies and badlands of South Dakota. This is the tribe’s traditional territory, once the source of its sustenance and still the bedrock of its cultural identity. It is a place of rugged beauty, endless vistas and almost inconceivable poverty. Though accurate statistics are hard to come by, Pine Ridge is generally considered the poorest place in America. According to the nonprofit group, True Sioux Hope Foundation, some 97 percent of the inhabitants live below the poverty line, with unemployment at around 90 percent. An Indian Health Services hospital in the town of Pine Ridge provides limited services, and there is a clinic in the village of Kyle. Either could be two hours’ drive, according to Mattingly. Specialty care is provided only off the reservation, hours away in Rapid City or further. For five days, the nursing students practiced community health here. They tested residents for cholesterol, measured blood pressure and screened for diabetes via blood glucose checks. They also distributed a variety of basic sundries and medical items, including toothbrushes and toothpaste, condoms, booster seats, bubbles, and more. They also offered health education, encouragement and, for those who already showed healthy behaviors, reinforcement. The students were required to create blogs to record the events, but also to process their experiences on a deeper level. Mattingly had screened students before the class, to make sure her cohort was emotionally up to the task of confronting dire need, extreme poverty and serious social dysfunction. "It’s not for everybody," she said. But for Abbott and the others, it was instantly appealing. For Abbott, a self-confessed "military brat" with wanderlust and a commitment to mental and psychiatric health, the trip promised more than the usual clinical experience. "There is something special about being able to go into a community and talk and connect with your patient, their family and their environment," she said. Stillwell, whose focus is pediatric critical care nursing, also felt pulled to the course, having grown up hearing of her sister’s positive and rewarding experiences working among the Cheyenne. The Pine Ridge experience is a complex mix. The confrontation with extreme poverty and inadequate healthcare delivery blends with positive personal interactions to bring students to a new understanding of their patients and their field. "Pine Ridge provides a prompt for students to consider caring for others with a wider lens," Mattingly said. "They are provided reinforcement for considering social justice, advocacy and cultural competence as integral parts of nursing." For Abbott, Stillwell and some of their classmates, seeing Pine Ridge put their own efforts into a much bigger perspective. "It’s one thing to hear of the barriers this population faces in receiving health care, but it is another thing to see it first hand," Stillwell said. In some ways, the experience was humbling. It seemed to many of the students that their efforts were like water on a hot rock, in the face of so much hardship. Stillwell and Abbot also shared the impression that locals were wary of testing because they feared learning that they might have a condition that, ultimately, could not be treated. The challenge of community health shifted then, in the minds of the students, from simply providing a service to persuading and reassuring individuals that their health mattered, to the students as well as to themselves. This shift forced the students to tap into their own personal reasons for pursuing this profession, in a way that a normal hospital rotation would never be able to do. "This trip allowed me to reset and refocus on what drew my heart to nursing originally, which is simply just to be compassionate and help others," Abbott said. "It showed me how the power of nursing can positively impact a community." IU East's course in pediatric community clinical nursing aligns with several priorities in the university's Bicentennial Strategic Plan, including a commitment to student success, catalyzing research and health sciences research to improve the nation's health.